The Panama Canal expansion will clearly help LNG exporters, but what about tanker companies? When you're in business to solve a problem, and that problem suddenly diminishes, your customers won't need you as much, and you'd normally expect your business to suffer. That's what can happen to transport companies when someone builds a bridge, blasts a tunnel through a mountain, or digs a canal. Product sellers are happy because of lower shipping costs, and carriers are unhappy for the same reason. So the Panama Canal expansion project, which will lower costs of LNG shipments from the U.S. Gulf Coast to Asia, will clearly benefit LNG exporters like Cheniere Energy (NYSEMKT:LNG). But will tanker companies suffer? It turns out that companies like Golar LNG (NASDAQ:GLNG) and Teekay (NYSE:TK) may do quite well as a result. Asian demand for LNG continues to grow. A relative lack of pipeline infrastructure in the region means places like Singapore must import LNG. Japan has moved away from nuclear power in response to the 2011 earthquake, tsunami, and subsequent Fukushima disaster, creating more demand for natural gas to fill the void. Finally, as China attempts to clean up its smog-bound cities, it may turn away from coal to clean-burning gas. Asia receives much of its LNG from Qatar and increasingly from Australia. Canada is another potential source as LNG export projects pop up on the West Coast. Finally, projects like Cheniere's Sabine Pass facility under construction in Louisiana and its planned Corpus Christi liquefaction plant in Texas could supply Asia from the U.S. Gulf Coast. According to a Bloomberg report in November, the round-trip voyage to Fukuoka, Japan, from Sabine Pass, Louisiana, currently costs about $11.4 million and takes 63.6 days as ships cross the Atlantic and transit around Africa. Once the Panama Canal expansion is complete, LNG carriers going through the canal would cut the cost to $8 million and the time to only 43.4 days. So with each round-trip to Asia costing about $3 million less, it seems that the tanker companies would see reduced revenues. To see why this isn't the case, let's consider the situation both with and without the expansion project. With LNG shipments unable to go through the canal, the price of U.S. Gulf Coast LNG would remain high in Asia, causing buyers to turn to Qatar, Australia, and Canada instead. Also, exporters like Cheniere would more likely seek buyers in Europe, where demand is not as high, but shipping costs and round-trip times are lower. Tanker companies would continue to operate along these shorter supply lines with their lower revenues per trip. But with the expansion of the canal, Asia would open to the U.S. Gulf Coast. Bloomberg quoted Christian Waldegrave, Teekay's market research manager, as saying that ship owners will benefit from increased trade and longer voyages from the U.S. compared with suppliers such as Australia. So the trip to Asia through the canal, while shorter than the trip around Africa, is still longer than the runs from Australia, western Canada, or the Middle East. Thus the tanker companies will have longer runs and see revenues increase after all. The logically named Panamax type vessel is the largest that can fit through the Panama Canal, and has a maximum width of 106 feet. After the expansion, the new Panamax standard will be about 160 feet in width. A look through the specs of Golar's existing 11 LNG carriers shows that while none of them could fit through the canal today, all of them meet the new Panamax standard. The nine ships the company has on order have the same capacity as Golar Celsius, one of its largest existing ships, so it looks like these will meet the new Panamax standard as well. The same is true for most of Teekay's carriers, with the possible exception of its four largest. These are about three feet wider than the new Panamax standard, but they're operating near Qatar and Singapore anyway. The Bloomberg report quoted company officials as saying that it has already booked two tankers to carry U.S. exports under 5-year contracts. The project is in the news. The Panama Canal expansion started in September, 2007, and was 76.3% complete at the end of May according to the Panama Canal Authority. 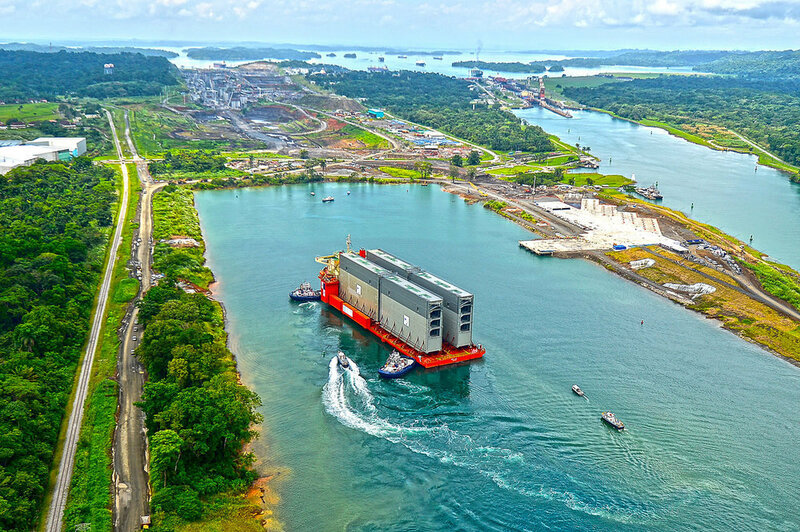 On June 10, four more gates for the new locks arrived, and on July 1, the Society of International Gas Tanker and Terminal Operators launched its new Guidance for LNG Carriers Transiting the Panama Canal publication. The Panama Canal Authority expects the $5.2 billion project to be complete by January, 2016, according to a report by the Australian Associated Press. As the expansion of the canal comes closer to fruition and news coverage intensifies, expect the ramifications to seep into the market's consciousness. As that happens, LNG exporters like Cheniere may rise, but misconceptions about the effects on tanker companies like Golar and Teekay may keep them undervalued until the results start rolling in. That could be a lucrative opportunity to add to positions in these companies.